In today’s society and the world, we are always “plugged in” and have a difficult time disconnecting. When walking down the street, most people have their phone in their hands or earphones in listening to music or a podcast or even talking to someone. We live in a world now where it is so easy to reach someone, and we do not even have to call them; we can just text them. It is hard to recognize when we might be addicted to our phones or even if it is a real addiction. In the DSM-V (Diagnostic and Statistical Manual of Mental Disorders), technology addiction has not been identified, but it falls more into obsessive or compulsive behaviors. It is a larger term to identify various addictions. In this post, I will go through some questions to ask yourself or your loved one if you feel like you might be addicted to technology. If you feel like you have an addiction, please contact a trained professional to seek support that you might need. 1. Do you feel like you always need to be checking your phone or computer to see what is going on? Do you feel like you are constantly needing to check the internet? 2. Do you feel like your time has increased with technology to feel better? Has the time increased for the past few months or weeks? 3. Do you feel some sort of withdrawal symptoms when you are unable to be on the internet? Moody? Depressed? Agitated? Angry? Annoyed easily? 4. Do you get on your phone or computer to check one thing and then start checking other things and spend more time than expected on technology? 5. Do you use technology as a void to ignore feelings? Feelings such as happiness, guilt, depression, anxiety, etc? 6. When you hear your email notification or text alert do you feel the need to check your phone right away to see who is contacting you? Do you also feel the need to respond right away? 7. Do you ever feel your phone vibrating when it is not really and you have to check your phone? Do you feel like you check your phone even when nothing is going on? 8. Do you feel like your with friends or family and you have the need to check your phone? For example, you are at dinner with friends or family and your phone is on the table just in case someone needs to contact you? 9. Do you feel high anxiety when you are away from your phone or computer? Do you feel like a part of you missing when you do not have your phone? Other signs of technology addiction always having your phone or computer close to you. Feeling your hands hurt when holding your phone. Feeling pain in your fingers from texting or typing for so long. Having neck pain from looking down on your phone or computer for so long. There are other apps for phones that will also monitor how much time you are spending on your phone. Being able to recognize that you are on your phone or tablet first is a big step in your recovery. There are also apps for your phone that will not allow you to be on it during certain times of the day and disconnect from the outside world. 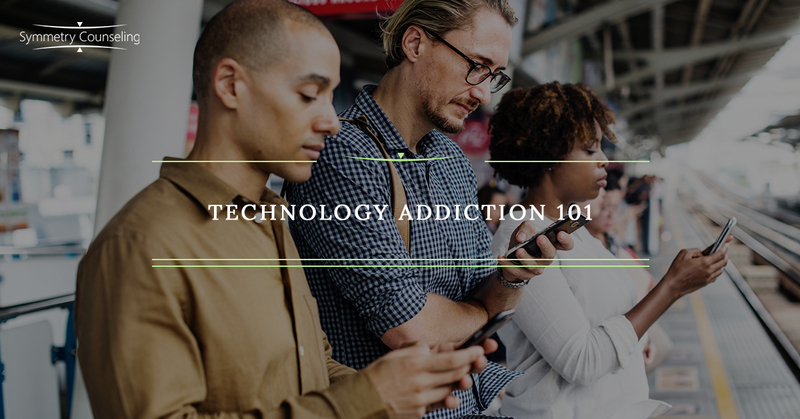 If you feel like you are addicted to technology, please contact our talented professional counselors at Symmetry Counseling to get the support you may need. We also offer a FREE 20-minute phone consultation to help you find the right therapist.